NOTE: The important part of this recipe is that the amount of active sourdough starter (stirred well) should be about equal in volume to the total amount of flour used (1½ cups of each). This is a recipe where the actual weight of the ingredients isn't as important. In a large bowl, combine the flour, starter and salt and mix (preferably with a dough whisk, but a wooden spoon works well also) until combined, then knead for a couple of minutes until dough reaches a nice pliable consistency. If, at this point, the dough is too dry and not combining well, you may need to add a little water (start with one tablespoon) to get it to the consistency you want…it should be workable, but still a little stiff. When the dough feels right, add the 2 tablespoons of olive oil and continue kneading the dough for about 5 minutes. It will be a sticky mess when you start but will slowly transform into smooth pliable dough. Divide the dough into 3 balls (each should weigh about 200 grams) for three thin crust pizzas or 2 balls (about 300 grams each) if you prefer your pizza crusts a little thicker (*see note below for freezing directions). Lightly coat the dough balls with olive oil, cover with plastic wrap and let sit at room temperature for about 1 1/2 to 2 hours. The dough is now ready to go. 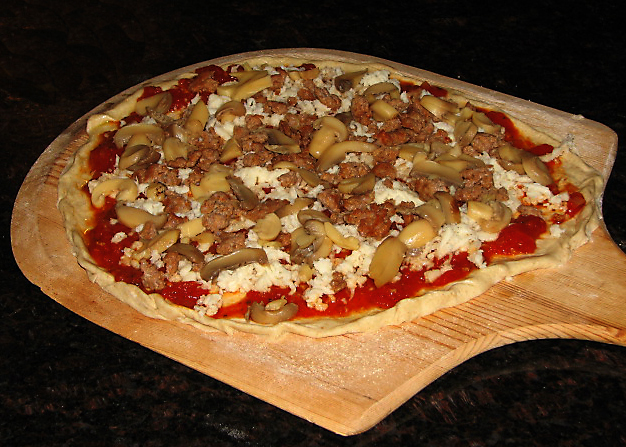 Just roll each ball out to a 12” round, add sauce, cheese and your favorite toppings, pop into a preheated 500 degree oven (preferably on a preheated pizza stone or baking steel) for about 12 minutes and you have an amazing, homemade pizza.